The AirPort Express received a redesign on Monday, adding features previously only available in the AirPort Extreme, such as dual-band Wi-Fi. 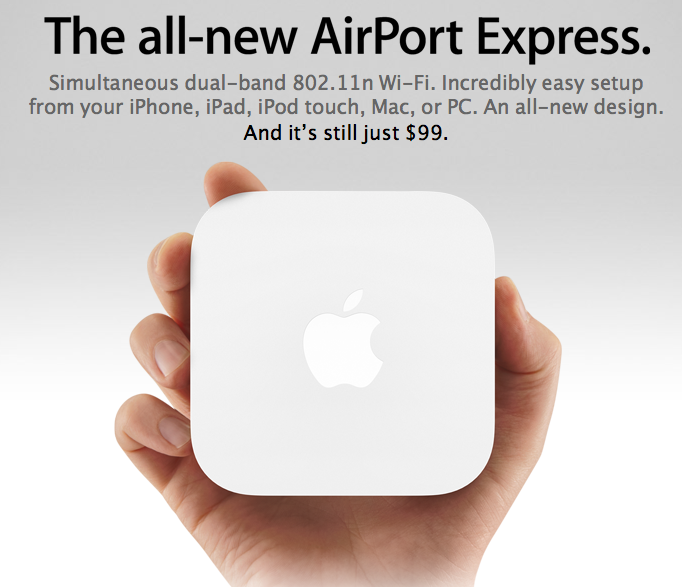 Priced at $99, the new AirPort Express features a completely redesigned compact enclosure and new wireless and connectivity capabilities. Simultaneous dual-band 802.11n Wi-Fi allows users to create a network that delivers optimal performance and range. The AirPort Express also features an audio-out port to connect external powered speakers or an A/V receiver and use AirPlay to wirelessly stream from iTunes on a Mac or iOS device. A USB 2.0 port also allows users to share a printer wirelessly over your network, and an additional ethernet port lets users connect to other computers and network devices. Setup for the AirPort Express is built into OS X and iOS, and with AirPort Utility 6.0 for OS X Lion and iOS, users can access a visual map of their network for viewing and reconfiguring devices.